Happy Year of the Earth Pig! 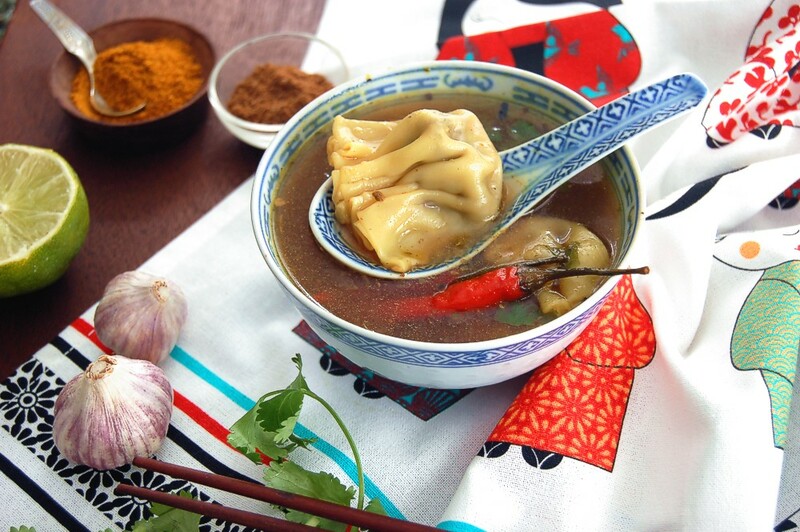 To celebrate the Lunar New Year and this festive occasion, we made a simple Curried Broth with Cabbage & Pork Dumplings. For my version, I used a veggie ‘ground round’ making this soup a great vegan option. While good wishes and fortunes are exchanged, lucky red envelopes of money is gifted and fireworks dot the sky, food plays a huge part of the Chinese Spring Festival. There are many different foods eaten to ring in the Chinese New Year and of these, one of them is dumplings, which are considered to bring prosperity, as they resemble gold bars. I actually like to make mine more in the shape of ‘golden’ nuggets or parcels, but if you’re going with tradition, be sure to make these resemble a bar of gold! I made a simple yet delicious Curried Broth to house these precious little Chinese Five Spice Cabbage & Pork dumplings. And the result was just delicious. 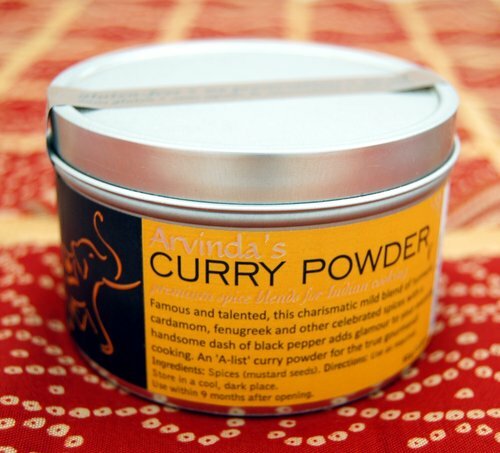 1) BROTH: Simmer vegetable stock, season with soy sauce, lime juice, sugar, and ARVINDA’S CURRY POWDER. Add chilies, garlic and ginger. Simmer for 10 minutes and set aside. 2) DUMPLINGS: In a skillet, heat sesame oil and fry garlic for a couple of minutes until fragrant. Add pork or veggie ‘ground round’. Season with CHINESE FIVE SPICE, sesame seeds, soy sauce, rice vinegar. Stir in cabbage and cilantro and cook for 10 minutes or until everything is well cooked. 3) Place dumpling wrapper on a well floured surface. Moisten edges with water and place 1 tablespoon amount of filling. 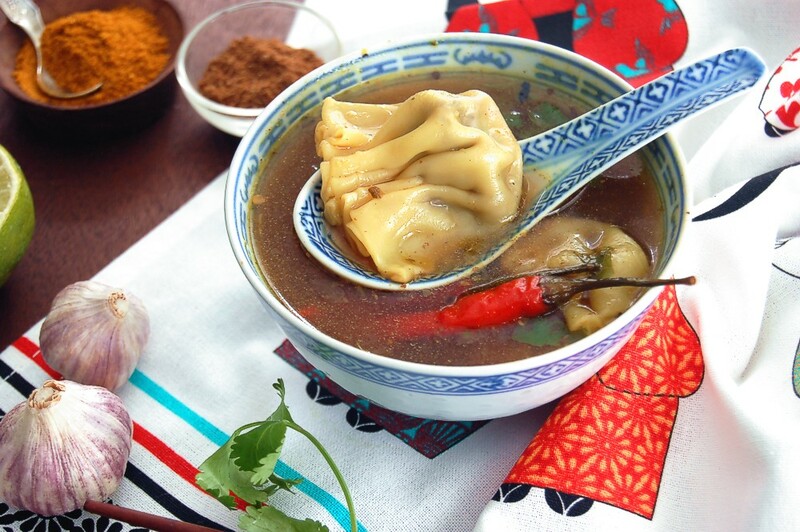 Fold over and create pinches to seal dumpling into a half moon shape (or parcel). Continue with rest of dumplings. 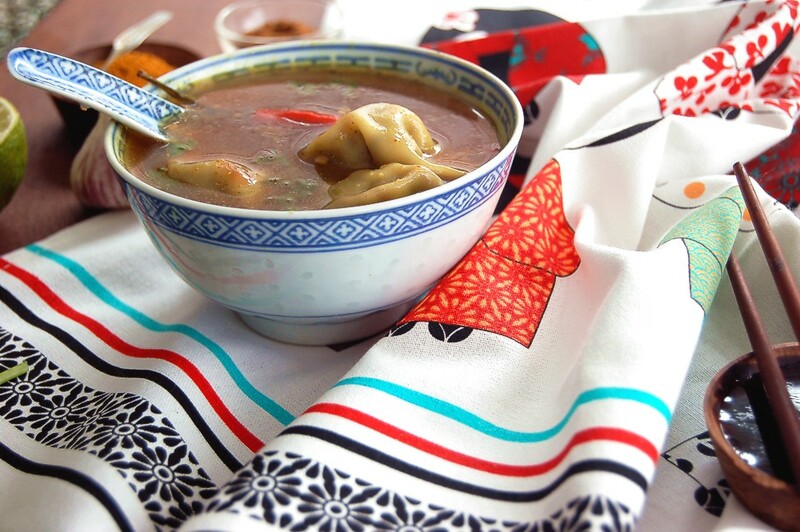 4) Gently place dumplings in Curried Broth and simmer for 10-15 minutes until dumplings are cooked. 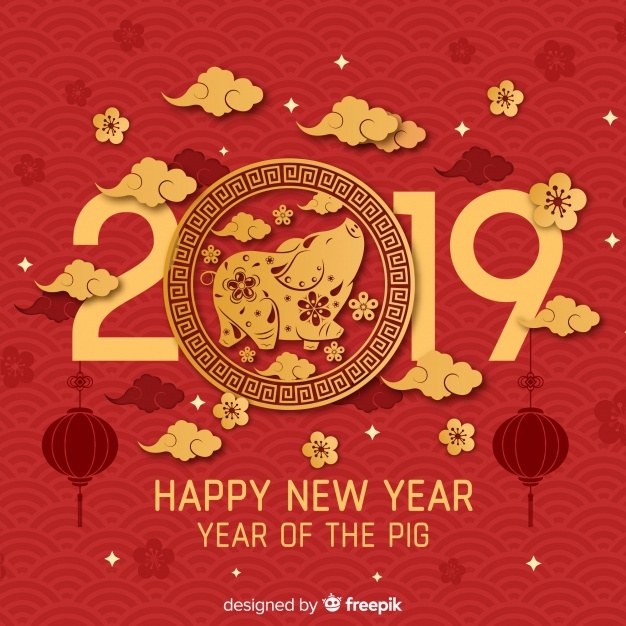 Wishing you prosperity, warm wishes and good luck for the Lunar New Year!